QUESTION Is the condition of the comb a reliable indication of the health of a fowl? ANSWER – Yes. If the comb is not its natural color, there is something wrong with the bird. QUESTION What could cause apparently healthy birds to die suddenly without any ascertainable cause? ANSWER – It is usually apoplexy. It is the result of a rupture of one of the blood vessels of the brain, and may be caused by over-feeding, or too stimulating food, or injuries. It may also result from violent exertion or straining in laying eggs. 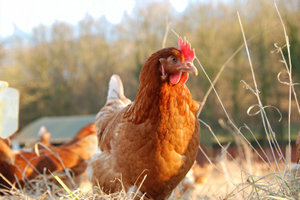 Hens are often found dead in the nest or under the perches from this cause. There is no remedy, as the bird dies before the trouble is discovered. QUESTION What are the symptoms of “egg bound” and the remedy for it? 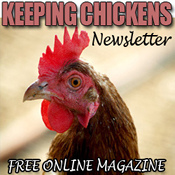 ANSWER – The fowl makes repeated unsuccessful attempts to pass the egg and becomes listless with roughened plumage. A hard lump may be felt in the posterior portion of the body. Inject a small quantity of sweet oil and endeavor to remove the egg by pressure. Sometimes it can only be removed by pricking the shell and allowing the contents to escape, after which remove the shell with the fingers. In aggravated cases the egg may break through the weakened tissue and escape into the abdominal cavity, in which case the bird should be killed. There is some more about egg bound chickens here. The video below gives an overview of coccidiosis in chickens, and shows how devastating just one bird with Coccidiosis can be to an unprotected flock. It includes some archival footage of chicks with coccidiosis showing symptoms of the disease as it progresses which some may find upsetting. The best protection is prevention : good sanitation coupled with a medicated chick feed or vaccination.